IRS scandal: Tea Party groups' tax-exempt status is the new normal. 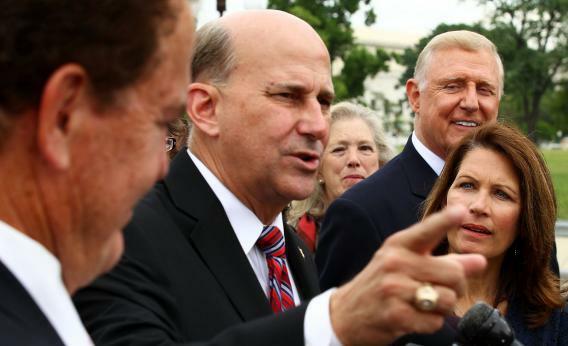 U.S. Rep. Louie Gohmert (R-TX) speaks as Michele Bachmann (R-MN) and former Rep. Dan Burton (R-IN) listen during a news conference after the first meeting of the Tea Party Caucus on July 21, 2010 in Washington, DC. My new story on this Time of Scandal delves into the history of politics and tax-exempt groups. Until very recently—by which I mean “until last week”—both parties seethed at the outrage of obviously political groups getting tax exemption and then playing in the public sphere with secret donor cash. There’s also an irony running through the last two days of Tea Party complaints about the hassling from the IRS. You hear that the scrutiny, by slowing down the groups’ activities, affected the 2012 election. It’s just assumed that these social welfare groups were going to have a political impact, and that’s normal.